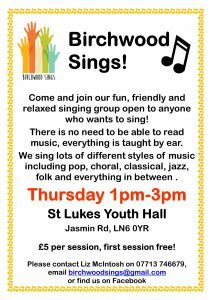 Birchwood Sings is a fun and friendly singing group open to anyone that wants to sing! Everyone is welcome from new singers to experienced singers. Set up in January 2016, we have worked with people across the Birchwood, Doddington Park and Lincoln City to encourage them to sing. You don’t need to be able to read music, everything is taught by ear. We cover a wide range of songs and there should be something to suit everyone’s’ taste. We sing pop, choral, classical, jazz, folk and everything in between. For those members of the Choir who want to, we perform at a variety of functions across the year including regular performances at the Lincolnshire Show, and the Festive Food and Drink Fair as well as supporting local events.